Click here to register for ATA's 39th Annual World Congress. 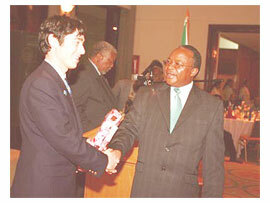 (From left to right) Edward Bergman, ATA Executive Director, and Honorable Professor Jumanne Maghembe, Tanzania's Minister for Natural Resources, at ATA Congress in Ethiopia in May 2007. NEW YORK, N.Y: The Tanzanian Ministry of Natural Resources and Tourism and the Africa Travel Association (ATA) announced that Tanzania will host the Africa Travel Association's 33rd Annual Congress from 19-23 May 2008 in Arusha, the country's "Safari Capital." The announcement was made by Honorable Professor Jumanne Maghembe, Tanzania's Minister for Natural Resources, and Eddie Bergman, ATA Executive Director. ATA has significant ties to Tanzania. In May 1998, ATA held its first-ever Congress in Arusha; and in December 2003, Zanzibar hosted ATA's Eco and Cultural Tourism Symposium. Tanzania also led the association for four years, holding the position of President of the ATA International Board of Directors. "When Tanzania hosted ATA in 1998, it marked the official re-launch of our country's promotion in the American market," said Minister Maghembe. "The results were excellent. Tourism to Tanzania is now booming. The rapid growth in the number of tourists from the American market in these past nine years since the ATA Congress has resulted in the U.S. becoming the number two source for Tanzania visitors worldwide. Now, we anticipate that hosting the 2008 Congress will most definitely generate even more tourism growth from the U.S., soon making it the number one source market. Tanzania's goal is to receive 150,000 American visitors annually in the next few years." According to Bergman, "As ATA actively pursues a campaign to 'bring the world to Africa and Africa to the world,' Tanzania provides an excellent venue because its diverse and booming tourism industry is attracting record numbers of visitors from all over the world, including Asia. Given Tanzania's close ties to China and ATA's partnership with the Pacific Asia Travel Association (PATA), ATA will realize its goal to make the 33rd Congress break new ground by having for the first time a delegation from the Asian travel industry." Tanzania, the largest country in East Africa, has dedicated more than 25% of its land to wildlife conservation. It is the home of Mount Kilimanjaro, the highest mountain in Africa, and eight world heritage sites, including Serengeti, the site of the great animal migration, which was recently named the "New 7th Wonder of the World" by Good Morning America and USA Today. Leading Tanzania tourist attractions also include the Ngorongoro Crater, Selous Game Reserve and Stone Town on the spice islands of Zanzibar. Peter Mwenguo, Tanzania Tourist Board's Managing Director said, "Tanzania expects to raise its profile and increase these numbers even more as it continues to host major international conferences like the TED Global Conference in Arusha this June." Mwenguo added, "Along with a growing number of attendees, more and more visitors are seeking out Tanzania for adventure travel, and for an opportunity to interact with the local people and learn about their culture. [English is the official language along with Kiswahili.] And, although Tanzania is often perceived as a slightly more expensive destination, the country offers the best value for money and quality of services. We have been very careful to protect Tanzania from becoming a mass tourism destination. Our low volume/high yield policy has kept the crowds from the parks and protected the quality of the visitors' vacation experience." ATA's five-day Congress program will address topics such as new tourism growth markets, Asia outbound travel, and social responsibility and the travel industry. It will also include roundtables for ministers and suppliers and tour operators, networking events, a marketplace expo, host country days, gala dinners, and award ceremonies, as well as pre and post-country tours. ATA's Young Professionals Network and African Diaspora network, which were established at ATA's 10th Annual Eco and Cultural Tourism Symposium in Nigeria in November 2006, will also meet. Last year's 32nd Annual Congress was held in Addis Ababa, Ethiopia from May 6-11, 2007, bringing leading tourism industry experts from more than 20 countries in Africa, North America, Europe, and Asia came together to participate in the five-day event devoted to 'branding Africa as a tourist destination.' Ethiopian Airlines served as the Official Congress Carrier. The Africa Travel Association is the premier global travel association promoting tourism to Africa and intra-Africa travel and partnership since 1975. ATA members include ministries of tourism and culture, national tourism boards, airlines, hoteliers, travel agents, tour operators, travel trade media, public relations firms, students, NGOs, individuals, and SME's. Upcoming ATA events include ATA's 11th Annual Eco and Cultural Tourism Symposium in Djibouti City, Djibouti from January 19-23, 2008 ATA's first Africa Sports and Tourism Market from 27-28 February at the Jacob K. Javits Center in New York, and ATA's 33rd Annual Congress in Arusha, Tanzania from May 19-23, 2008. 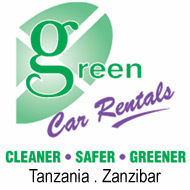 For more information, visit ATA online at www.africatravelassociaton.org or call +1.212.447.1357.